ESA’s Cryosat-2 satellite is set to embark on its mission above Earth’s poles on 25 February. With its altimeter, aided by the DORIS instrument, it will monitor variations in ice elevation and thickness with millimetre accuracy. 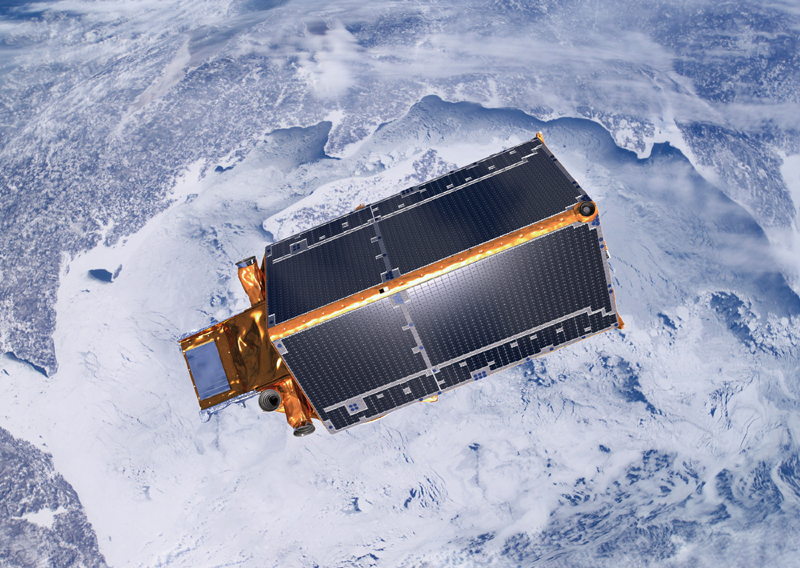 Cryosat-2 is scheduled to monitor ice surfaces for 3 years. Credits: ESA. Perched in near-polar orbit, the satellite will regularly fly over the polar ice caps, which play a key role in regulating Earth’s climate. On each pass, Cryosat-2’s altimeter will measure ice elevation in and the Arctic, as well as that of sea ice and mountain glaciers. Radar waves from the Cryosat-2 altimetry satellite. Credits: ill. ESA. The radar altimeter will use different viewing modes to suit the topography it is observing. For example, over rugged terrain like the edge of Antarctica or glaciers, the altimeter will acquire measurements at 2 different angles to map relief. Cryosat-2’s continuous observations will let scientists monitor seasonal and annual variations in ice elevation and thickness, and study their impacts on sea-surface height. And it will do all of this with millimetre accuracy. “All data will be archived at CNES so we can generate altimetry data products on demand,” explains Françoise Schiavon. 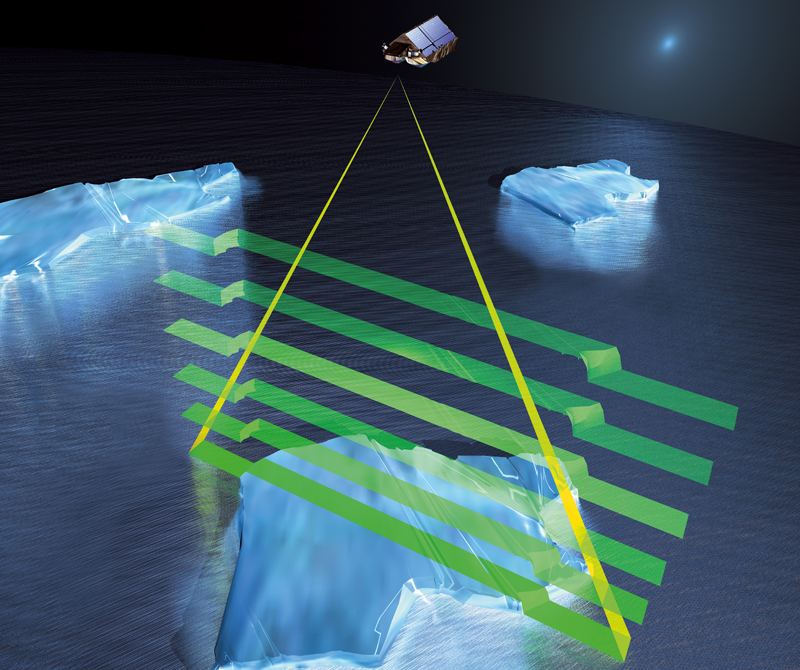 The radar altimeter on Cryosat-2 is also capable of measuring the height of the “tip” of an iceberg. Credits: ESA/Ill. AOES Medialab. To obtain measurements this precise, Cryosat-2 will be assisted by a system developed by CNES and now in its 20th year of service: the DORIS system. “DORIS gives a satellite’s precise orbital position to within 1 centimetre. By combining this information with altimeter measurements, we obtain the range from the satellite to the ice surface, and, therefore, the thickness of the polar ice caps,” explains Albert Auriol, in charge of DORIS at CNES. In addition to precise orbit determination measurements, processed by ground teams in Toulouse, France, DORIS will also measure the altitude of Cryosat-2 in real time, thereby helping the satellite to maintain its position. “That’s a 1st for a satellite,” points out Albert Auriol. Cryosat-2 at ESA’s IABG test centre in Munich. Credits: ESA. DORIS’s other mission will be to precisely determine the position of ground stations, which in turn will serve as global reference points to measure sea level or tectonic plate motion, for example. Cryosat-2 is currently awaiting launch at the Baikonur Cosmodrome and will be orbited on 25 February atop a Russian/Ukrainian Dnepr vehicle. Lift-off is scheduled at 14:57 CET.